Posted: June 15, 2018 Updated: June 21, 2018 by onlineph | Filed under Government, Internet, Public Service. Due to the increasing backlog, many Filipino are cursing the incompetence of the Department of Foreign Affairs or DFA in opening more slots to cater all those who wants to apply or renew their passport. The passport appointment system was controversial in January of 2018 due to the slots being fully booked until March of the same year causing many workers and travelers so much inconvenience. This is why to accommodate the influx of applicants, The Department of Foreign Affairs Secretary Alan Peter Cayetano released a statement on Thursday announcing that the DFA will open about 100,000 appointment slots for those who want to apply for a passport and those who wished to renew their passport. He clarified that the 10k appointments are on top of the 336,743 appointment slots for June 1 up to the 30th of September 2018 that are already taken. 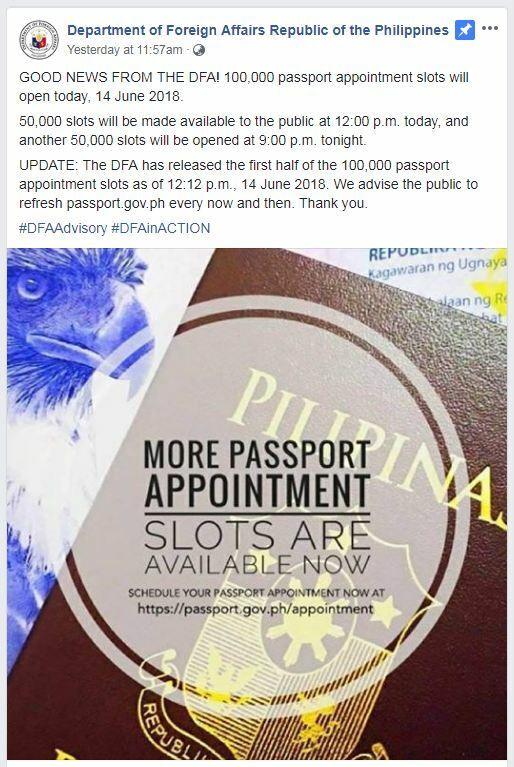 He also said in the briefing that the 50k slots will be open and available at the DFA website from noon and the other 50k will be open at around 9 p.m.
DFA now requires advanced payments for Passport appointment schedules. He added that the department also plans to open another 10k slots from Mondays to Saturdays at aroud 12 noon onwards until 9 p.m to further accommodate the rising number of passport applicants nationwide. However, only 12k slots are open for online applicants while 1,000 slots are available for the first time overseas Filipino workers through their licensed recruitment agencies, 4k slots for passport on wheels, and 2k slots for walk- in applicants. The earliest appointment available in the website for the DFA office located at Aseana is on June 25. The agency reminded the applicant to refresh the website for the opening of more appointment slots.